Hello! This is another one of the flowers from A Muse Studio's Tropical Blooms set that I had made extras of. 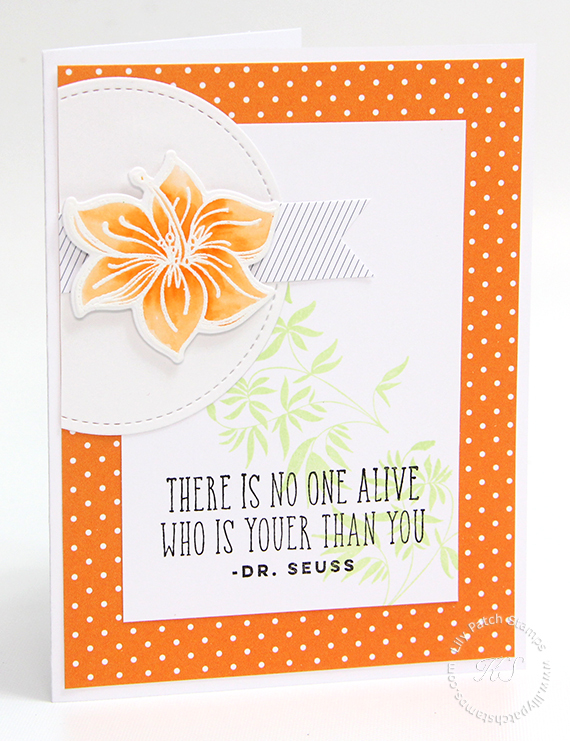 I had to find a way to incorporate this awesome Dr. Seuss sentiment into this card. The flower was embossed using white embossing powder and watercolored in with Tombow markers. I also used the plants from the Be Yourself set to create the background on the Sugar cardstock. Beautiful flower - love your colors - perfect summer card. Such stunning combination of sweet bloom and cheerful color! Absolutely love this beautiful card! Thank you for sharing your card at ATCAS! Wow this is such a great design love your take on the aloha challenge. Thanks for joining us over at ATCAS. Amazing card design.. Thanks for joining us at ATCAS!! This card is stunning and I love the sentiment! Thanks for joining us Die Cut Diva's!!! Wow, this card is gorgeous!! Lovin' the orange. Fun sentiment too. Thanks for joining our tic tac toe challenge at Imagine That Digistamps Creative Playground.